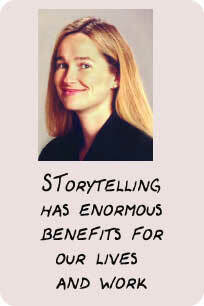 What are the potential benefits of storytelling? Communicate quickly: Storytelling communicates ideas holistically. As a result, listeners can get complicated ideas not laboriously, dimension by dimension, but all at once with a new gestalt, which is transferred with a snap. Communicate naturally: Storytelling is our native language which we know how to do at the age of two. Abstract language by contrast is something that we learn at the age of eight or later and becomes a kind of foreign language that we rarely feel as comfortable in as our native language, storytelling. Communicate clearly: By drawing on this natural age-old method of communication, storytelling helps us make sense of a chaotic world by connecting us with time and space and human purpose of a sequence of events so as to make sense. Communicate truthfully: Stories can communicate deep holistic truths, while abstract language tends to slice off fragments. Communicate collaboratively: In abstract discussions, ideas come at us like missiles, invading our space and directing us to adopt a mental framework established by another being, and our options boil down to accepting or rejecting it, with all the baggage of yes-no winner-loser confrontations. Narrative by contrast comes at us collaboratively inviting us gently to follow the story arm-in-arm with the listener. It is more like a dance than a battle. Communicate persuasively: When the listener follows a story, there is the possibility of getting the listener to invent a parallel story in the listener’s own environment. Since we all love our own babies, the story so co-created becomes our own, and something we love and are prepared to fight for. Communicate accurately: Before the advent of instant global communications, there was les awareness of the context in which knowledge arises. When communications were among people from the same village, or district, or city, one could often assume that the context was the same. With global communications, the assumption of similar context becomes obviously and frequently just plain wrong. Storytelling provides the context in which knowledge arises, and hence becomes the normal vehicle for accurate knowledge transfer. Communicate intuitively: We know more than we realize. The role of tacit knowledge has become a major preoccupation because it is often the tacit knowledge that is most valuable. Yet if we do not know it, how can we communicate it? Storytelling provides an answer since by telling a story with feeling, we are able to communicate more than we explicitly know. Our body takes over and does it for us, without consciousness. Thus although we know more than we can tell, we can, through storytelling, tell more than we (explicitly) know. Communicate entertainingly: Abstract communications are dull and dry because they are not populated with people but with things. As living beings we are attracted to what is living, and repelled by inert things such as concepts. Stories enliven and entertain. Communicate movingly so as to get action: Storytelling doesn’t just close the knowing-doing gap. It eliminates the gap by stimulating the listener to co-create the idea. In the process of co-creation, the listener starts the process of implementation in such a way that there is no gap. Communicate feelingly: For all the talk about emotional intelligence, explicit talk about feelings can be cloying. Storytelling enables discussion of emotions in culturally acceptable and elegant way. Communicate interactively: Unlike abstract talk, storytelling is inherently interactive. The storyteller sparks the story that the listeners co-create in their own minds.